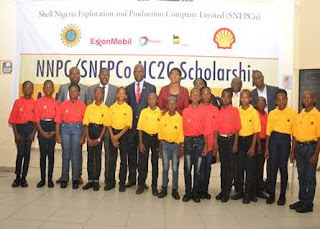 A second set of 104 pupils from six geo-political zones in Nigeria have been awarded full-board six-year secondary school scholarships by the Shell Nigeria Exploration and Production Company (SNEPCo), reports ITRealms. This, ITRealms gathered is the third set of the NNPC/SNEPCo National Cradle-to-Career (NC2C) programme designed to give top quality education to bright but indigent youths. The latest awards bring to 267 the total sponsorship since the NNPC/SNEPCo NC2C was introduced three years ago, according to sources at NNPC. The latest beneficiaries have joined the other recipients who are enrolled in six leading private schools – Lead Forte Gate College, Lagos; Premiere Academy, Abuja; Nigerian Tulip International College, Kaduna; St. Francis Catholic Secondary School, Lagos; Top Faith International Secondary School, Akwa Ibom State; and Grundtvig International Secondary School, Anambra State. During the award ceremony held at Lead Fort Gate College, Lekki in Lagos, the State Deputy Governor, Dr. Idiat Adebule commended SNEPCo for the success of the NC2C which she said had achieved its purpose by helping to bridge educational inequalities resulting from socio-economic differences. Pix; A cross-section of 2017 NNPC/SNEPCo scholars at the NNPC/SNEPCo National Cradle-to-Career scholarship award ceremony in Lagos.